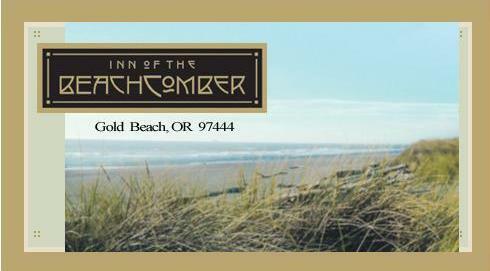 I have done the drive from San Francisco to Fort Bragg twice since I have owned the Beachcomber. About ten minutes after I wrote this I had to do it all again. That’s a story with this year’s exchange student from Minsk. So I would change the number to three. At least I can say I’ve been on all the roads in and out of the Forth Bragg- Mendocino coast area. From my perspective the best drive from the Beachcomber South would be to visit Redwood National Park and then head south to Willits and cut over to Fort Bragg on Hwy 20. The drive from Willits to Fort Bragg is 33 miles or about an hour of driving time. 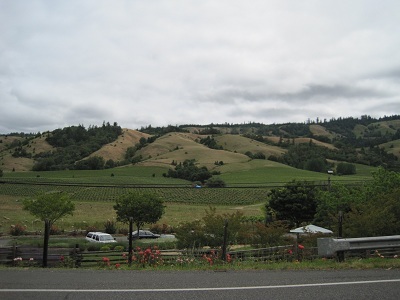 From the south Hwy 128 through Cloverdale is the ticket if you like wine as much as I do. Any way I hope you find this information helpful on your travels to the Lost Coast. The main point for outsiders is to know that you need to visit this spot if you’re close to Gold Beach and the Redwoods. 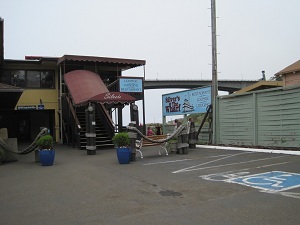 The drive from San Francisco to the Beachcomber is a little over 400 miles is you stay on Hwy 101. It’s an easy 8 hour drive without a lot of stops, 6 hours and a half if you pay attention. The majority of the driving is done at the posted speed limit of 65 mph or the 39 mph required of the redwoods. If you are going to drive Highway 1 through Mendocino and Fort Bragg it’s going to add miles and time as the road is a bit winding, ok that’s an understatement. Anyway it’s ok to drive slowly because it’s easer to stop more to enjoy the spectacular coast line. The drive up old Highway 1 if you cut over at Point Reyes is 443 miles. Do not pay attention to the time on the internet map engines; the computer has not driven the road. It takes a long time. My recommendation would be to cut over to Jenner before Santa Rosa on Roller Road then Valley Road to Highway 1. This is listed at 168 miles and 3.5 hours. It will take longer than that with traffic, view stops and the road. It’s a little tough out of Jenner because of the geography, but gets better after that. 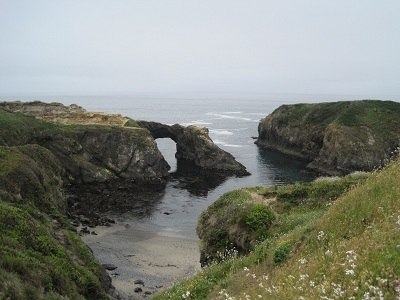 It would be a waste to drive from Oregon to San Francisco with out visiting the Mendocino -Fort Bragg area. When I first drove into Mendocino the weekend of their film festival. The town was buzzing and the fog was rolling in. I almost expected to see an old sea captain with a pipe emerge from the fog. The first thing I noticed about the town was the age of the architecture. 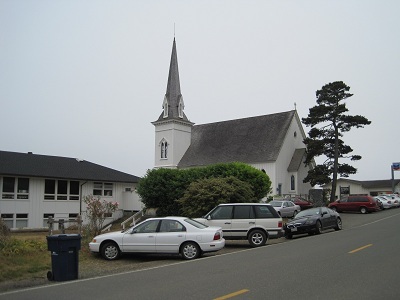 Mendocino Presbyterian Church on Main Street was dedicated on July 5, 1868 and is one of the oldest continuing used protestant churches in California. The deal is that most old towns of the west have burned down and been rebuilt. I’m thinking that hasn’t happened in Mendocino which makes it very cool. The town was originally founded in 1850 as a logging town and in 1971 most of the town was added to the National registrar of historical places. In the 1950’s it became an artist colony and the town has held a music festival since 1987. 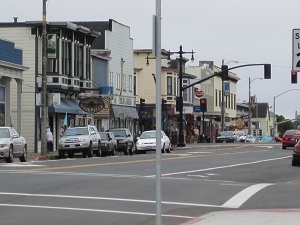 The town has been the scene for many movies but is best known as the location for the TV show Murder She Wrote with Angelia Lansbury. 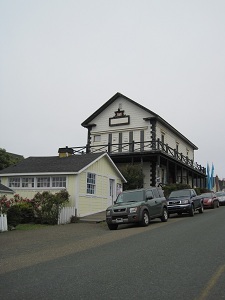 For lodging Mendocino has mostly B & B. Here is a link to a great site for more information on Mendocino:www.sallybernstein.com/travel/n_america/wus_mendocino.htm. In short I think Mendocino is a must stop for anyone exploring the Redwoods and the Southern Oregon, Northern California coast. Fort Bragg was founded in 1855 by First Lieutenant Horatio G. Gibson and was a military post and remained until 1864. 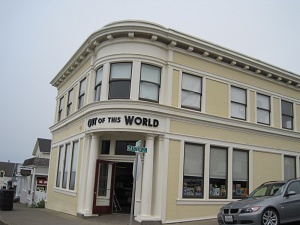 In 1885 C.R.Johnson who, with partners Calvin Stewart and James Hunter had been operating a sawmill in Mill Creek, moved their mill machinery to Fort Bragg to take advantage of the harbor for shipping.The company incorporated as the Fort Bragg Redwood Company. In 1893 it was renamed the Union Lumber Company. Fort Bragg was incorporated in 1889 with C.R.Johnson as its first mayor. The whole coast line of Fort Bragg is taken up by the former mill site which is a little odd for a town on the ocean to not have any ocean frontage. Any way Georgia Pacific owns the land and the town is hoping something big comes out of the old mill site. That’s the raw facts about Fort Bragg. Most of the downtown core of the city was rebuilt after the 1906 San Francisco earthquake and a few buildings still remain from the 1800s. In general the harbor area is old, well any time you are in a quasi industrial commercial area it always seems a little old. There are sport fishing charters that go out of the harbor for salmon fishing and boats that head out to the deep waters for tuna fishing. and begin the drive through the Mendocino wine country. After the first seven miles the road is not that bad, driving speed between 45 and 55 mph. After about 29 miles you get to Boonville which is home to the Apple Festival. This area used to be an area of apple orchards and to some existent still is but the vineyards have taken over and grapes are the main agricultural product grown in the region. 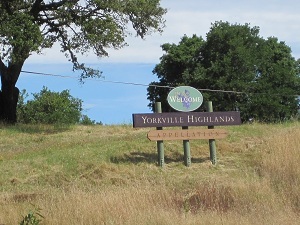 The vineyards and the oaks make for a picturesque drive and ample opportunity for picture taking. As far as wine tasting I counted at least 18 different wine tasting signs at the numerous vineyards. 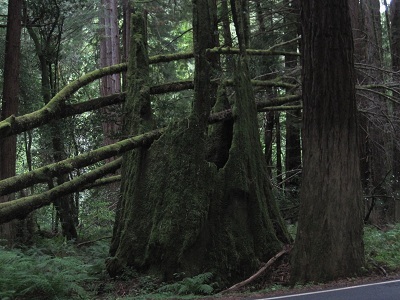 At about 45 miles into the drive you will hit the redwoods at Navarro River Redwood Park. The first time I did this drive at about the 52 mile mark I turned around to get some pictures of the second growth redwoods that are probably in the 100 year age range. It is something else so see the stumps that have been decaying for a hundred years next to the lush second growth redwood forest. We have all seen pictures of the loggers in the 1800’s on their boards ten feet or so in the air cutting these huge trees. These stumps are what’s left of the trees and is worth the drive. From Navarro River Redwood Park to Mendocino is about 16 miles. 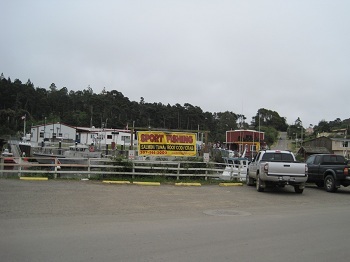 You hit the ocean in about 5 miles as you wind your way up to the village of Mendocino. Mendocino is just less than 10 miles up old Hwy 1 to Fort Bragg. For the most part it is back from the ocean and is pretty straight. I hope this information is helpful and we will be working hard to update the information this fall when I head back on down to the Mendocino & Fort Bragg area.